4724 Cheval Boulevard, Lutz, FL.| MLS# T3115350 | Westchase Real Estate - Westchase FL Homes For Sale - Westchase Local Experts. Located in the most prestigious section of Cheval The Estates. 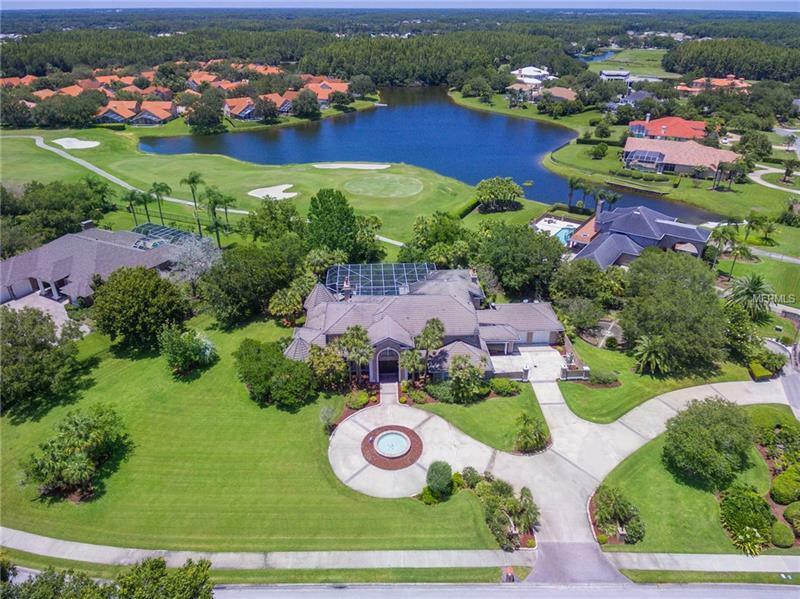 This custom 7158 square foot brick home sits right on the Cheval private golf course with golf course and waterfront views. Well over one acre lot (1.26 per tax rolls). This is one of THE most recognizable homes in Cheval. Five bedrooms and five and one half baths plus a huge game room with oversized balcony overlooking the golf course and pool area with a travertine deck to boot. Oversized master suite with sitting area fireplace two walk in closets and the master bathroom features a free standing Mediterranean style tub giant travertine shower with multiple shower heads a bidet and double vanities. Downstairs next to the master is an upscale home office with extensive wood work. Back yard is fenced and has very mature landscaping for total privacy. Massive circular driveway with water fountain connects to a side and front loading four car garage with courtyard. Two driveway entrances one off Pepper Pike and one off Cheval Blvd. Main entry of this home features huge solid iron double doors at entry. Luxurious details everywhere you look! Tray ceilings upgraded cabinetry wine cellar and arched 8 ft doors. Wood floors in the living room dining room master bedroom and family room with another fireplace. Circular stairs lead to the second level (two separate staircases) crystal chandelier and marble floors. Dream kitchen with island granite countertops oversized walk-in pantry stainless Thermador appliances gas cooktop (six burners) double ovens with warming drawer and wine cooler. Massive two story pool enclosure with heated spa and travertine pool deck that also has gorgeous wood paneled ceiling and outdoor kitchen with Viking appliancesbar and full appliances for outdoor entertaining.